how to make your tension square meaningful! Here’s where we clear the myths, mists and mystery surrounding tension squares. 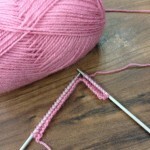 In our mini series ‘Learn to Knit’ we have mentioned tension squares quite a lot, so what exactly is a tension square and why do you need one? On a classic Double Knitting Yarn weight the tension might be 22 to 24 sts & 30 to 32 rows to 10cms (4″) square on 4mm needles. Tension is the number of stitches and rows measured over 10cms. 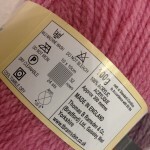 A knitted garment is designed by a mathematical calculation or grading based on this initial tension, so if you are knitting to a different tention to that stated in your pattern, then you will eventually produce a garment that is not sized correctly. 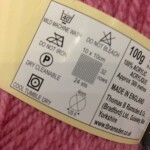 So tension is important in determining the finished garment size. Many knitters disregard the importance of knitting up that first tension square, and then blame the pattern or the yarn for their over large (or too small) garment! A tension square is worth the one evening to prepare and measure so that you can work on a garment over possibly several weeks or months that will be the right size for it’s wearer! Cast on the number of stitches stated in the tension part of the instructions, plus 6, keeping the first and last 2 stitches knit on every row, this helps the edges to lay flat. In this instance 30 sts. 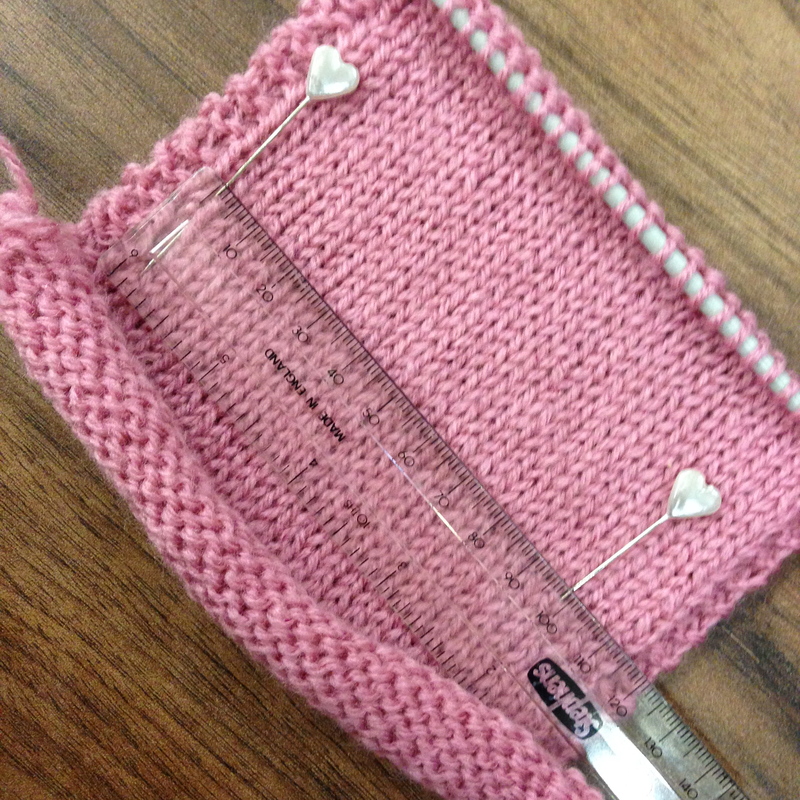 Work the square in stocking stitch until it measures 14cm. stitches, Repeat last 2 rows until square measures 14cm ending with a 2nd row. To count the stitches… A stitch makes a v shape and it’s these v’s that you count horizontally as one stitch. Lay the swatch flat and place a ruler horizontally on the square. Place a pin at the side of one and another pin 10cm away. Count the stitches between the two pins, including any half stitches. As discussed, a stitch makes a v and it’s these v‘s that you count vertically as rows. 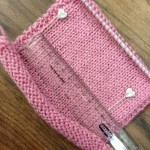 Lay the swatch flat and place a ruler vertically on the square. Place a pin at the bottom of one v and another pin 10cm away. Count the v shapes between the two pins, including any half stitches. For our example, if you have 24 stitches and 32 rows between the pins then you have the correct tension and can continue to follow the pattern. If you have too few stitches, e.g. 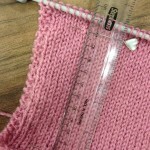 23, 22, or 21 etc, your knitting is too loose and the garment you knit will be larger than stated. to tighten up or condense your tension change to smaller needles, e.g 3.75mm. If you have too many stitches, e.g. 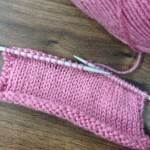 25, 26 etc, your knitting is too tight and the garment you knit will be smaller than stated. You need to loosen or augment your tension, so change to larger needles, e.g 4.5mm. If you are finding it difficult to obtain both the correct row and stitch tension together, then it is more important to achieve the correct stitch tension. This is because you can alway knit more (or less) rows at the end, but can’t add or take away stitches once you’ve knitted. 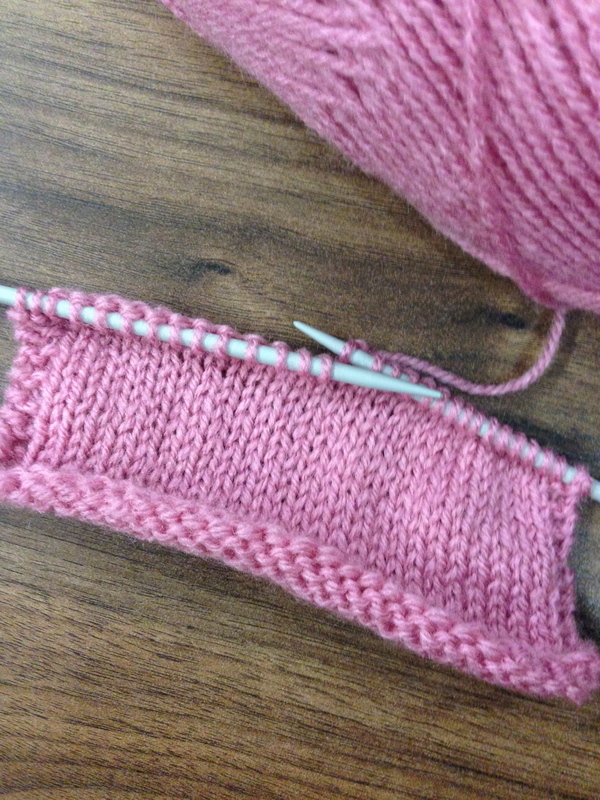 The pink yarn is Robin DK. The tension square is shown as a grid icon with 32 rows and 24 stitches shown and a 4mm needle icon. The lilac yarn which is Bergere de France Lima, is a lightweight DK. The photo just shows a tension square stating aig 3.5 which is short for ‘aiguille’ meaning needle 3.5m. It also states 24m horizontally inside the base of the tension square which is short for 24 mailles which is french for stitches and 30r is shown vertically which is 30 rangees or rows. So hopefully now, you can see the use of spending the time prepping a tension square befor you start your next knitting project. For all your knitting yarns, pattern books, kits and tools, the-stitchery is now online or you can visit us in our lovely shop in Lewes, upstairs at the Riverside. There are sometime offers online that aren’t available in-store – don’t forget you can buy online and collect from the-stitchery for free! Delivery is free with orders over £25. How good is that?